If you are like most other people, you probably listen carefully to the weather report when planning your day. You welcome the meteorologist into your home each morning as if he or she is a friend who has essential information to share with you. Without him or her, how will you know what to wear or whether you need to bring an umbrella with you when you head out the door? While you can use an app on your phone to find out the forecast, there's something more personal about watching it reported live on tv. It may even feel like you know your local station's meteorologist and perhaps you have even thought about what it would be like to do his or her job. 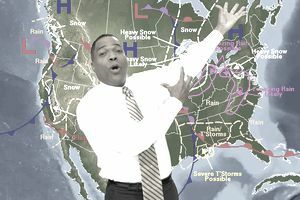 Technically, to call yourself a meteorologist, broadcast or otherwise, you must have a degree or at least have taken some college coursework in meteorology or atmospheric science. You don't need that degree, however, to work on a television newscast if you identify as a weatherman, weather person, or forecaster. Only individuals who use their meteorological education to report on the weather may call themselves broadcast meteorologists. With their specialized knowledge, they can study weather conditions and forecasts, and deliver that information to the public, just as news reporters do with the current events of the day. In 2016, broadcast meteorologists earned a median annual salary of $87,990. 12,000 people worked as atmospheric scientists in 2014, but relatively few of them were actually employed as broadcast meteorologists. They work for television networks, and local tv and radio stations. The job outlook for this occupation is good. The U.S. Bureau of Labor Statistics expects employment to grow faster than the average for all occupations through 2024. Competition for jobs will be intense. "Work with weather team to provide complete weather coverage"
"Utilize available technology to obtain weather-related data including web weather tools"
"Respond to breaking and/or severe weather events and other urgent newsrooms situations as required"
"Shoot and edit weather material"
"Update website and social media with news and weather coverage"
"Decide the best way to tell the “weather story of the day"
"Develop on-air graphics for clear and easy to understand weather presentation"
"Make public appearances as needed to reflect positively on the station"
Broadcast meteorologists need either a college degree or significant coursework in meteorology, or atmospheric or a related science. Classes in speech and journalism, or even a dual major in journalism or communication, can provide them with the skills they need to deliver the weather news. Many employers will only hire job candidates who have the Certified Broadcast Meteorologist (CBM) designation from the American Meteorology Society (AMS). To be eligible, you will have to earn at least a bachelor's degree in meteorology or atmospheric science from an accredited college or university or have taken specific coursework in that field of study. Broadcast meteorologists often begin their careers at television or radio stations in small markets. Some move into larger markets, for example, those in big cities like New York, Boston, LA, and Chicago, but competition is fierce. Some individuals make it to national news morning shows where they become part of the anchor team. To succeed in this career, you need certain soft skills, which are characteristics you won't learn in a classroom setting. Instead, you are either born with or attain them through life experiences. Analytical Skills: You will have to analyze large quantities of data in order to make predictions about the weather. Verbal Communication Skills: Superior speaking skills will let you inform the public about the weather. Interpersonal Skills: You must be able to establish rapport with your viewers and listeners. Critical Thinking Skills: When forecasting the weather, you will have to choose between different computer models. It will be your task to decide which one has the likeliest outcome. "Must have a positive attitude and ability to work with others in a changing industry"
"Always present a professional image as a representative of this station"
"Excellent computer skills and knowledge"
"Demonstrated ability to multi-task and work in high-pressure environments"
"Working proficiency using MS Office (Word, Powerpoint, Excel, Outlook, Project, etc.)" Bureau of Labor Statistics, U.S. Department of Labor, Occupational Outlook Handbook, 2016-17 (visited August 14, 2017). Employment and Training Administration, U.S. Department of Labor, O*NET Online (visited August 14, 2017).